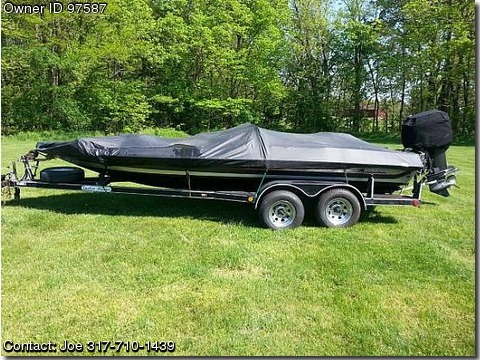 Please contact the ownr directly @ 317-710-1439 or jhutch72@netzero.com...1990 Stratos 201 bass boat. This is my Dad's boat, he bought it new and it's been garage stored at all times. Was used once per year for a fishing trip to Canada back when it was new for around 8 years and since then has been used very rarely. So hasn't been on the water much in the past 10 years or so. It's in very good shape, has multiple live wells, has lots of storage, has seats front, back and center. Has a 200HP Mercury engine with very few hours on it. Has the jack plate to raise and lower the engine. Fish finder, depth finders, trolling motor with foot controls, etc. Selling for him due to his health and the fact that it never gets used. I took it out last week with my kids on Morse Lake to test things out and it runs great, very fast, very smooth and ready for a new owner to actually take it out and enjoy it.